"I don't think I'll ever experience anything like being drafted by Montreal in Montreal. The fans there were absolutely insane. ... It was a good experience but now that's behind me and I know the hard work I have to put in to get back there." SIOUX CITY, Iowa -- Mac Bennett feels he'll never experience another day again like June 27, when the Montreal Canadiens called his name in the third round of the Entry Draft in Montreal. Perhaps he'll reconsider if and when he ever gets the opportunity to suit up for the bleu, blanc et rouge. 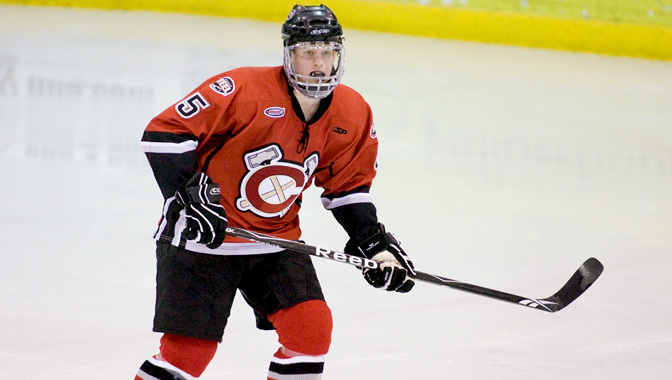 For now, though, Bennett will continue his journey to the professional ranks in the United States Hockey League this season with the Cedar Rapids RoughRiders, and then join the University of Michigan in the fall of 2010. "It was a good experience but now that's behind me and I know the hard work I have to put in to get back there." Bennett already has played a handful of exhibition games, including two contests in the USHL Fall Classic this week, and certainly has held his own. He feels the experience will prepare him for future battles. Kleinendorst embraces new challenge with U.S.
Cedar Rapids coach Mark Carlson sees the untapped potential Bennett brings to his blue line. "He's got a great future ahead of him," Carlson told NHL.com. "He's learning right now. He had a nice career at the Hotchkiss School (Conn.), was drafted by the Canadiens and is headed to Michigan -- he certainly has a lot to look forward to. His game has gotten better with each exhibition game we play. I thought he was much improved (in the Fall Classic) from our previous tournament and that's a great sign." Bennett has a great hockey pedigree as the son of former Cranston East (R.I.) All-State and Brown University All-Ivy League selection Jim Bennett. Despite his 5-foot-10, 180-pound frame, Jim Bennett was drafted by the Atlanta Flames in the eighth round (No. 133) of the 1977 NHL Amateur Draft. It doesn't end there, either. Mac's grandfather is former NHL goaltender Harvey Bennett, and his uncles are former NHL players Curt Bennett (6-3, 195), Harvey Bennett Jr. (6-4, 215) and Bill Bennett (6-5, 235). Uncle John Bennett starred in the World Hockey Association. Mac bulked up a bit in the offseason -- he now stands 6-foot and 175 pounds. "I actually tried to stay off the ice as much as I could to focus my attention in the weight room," Bennett said. "I'm not the biggest guy right now, but working to get there. I was in the weight room 4-5 times a week over the summer and I probably skated maybe once or twice a week." With Carlson as his coach, Bennett is confident his game will improve greatly. Carlson is the longest tenured coach in the USHL, having been coach and general manager of the RoughRiders since the team's arrival in Cedar Rapids in 1999. He's compiled nine straight winning seasons and nine straight Clark Cup playoff berths. It also should be noted that Carlson has coached current NHL players David Moss (Calgary), Justin Abdelkader (Detroit) and Teddy Purcell (Los Angeles) at some point in Cedar Rapids. "I feel this is a big step up from prep hockey and it'll be good for me to play a lot more games," Bennett said. "It's a lot faster game, there are bigger guys and older guys, so it's definitely a good step to the college ranks. Coach Carlson is the kind of guy I want in the locker room -- he's very fiery. He gives a heck of a speech before a game, so if we need a guy to fire us up, he's the one." Now that Bennett has his priorities in order, there's only one thing left to do -- learn a little French. "Yeah, I have to learn some," he said. "I only know the basic stuff right now and that's about it."